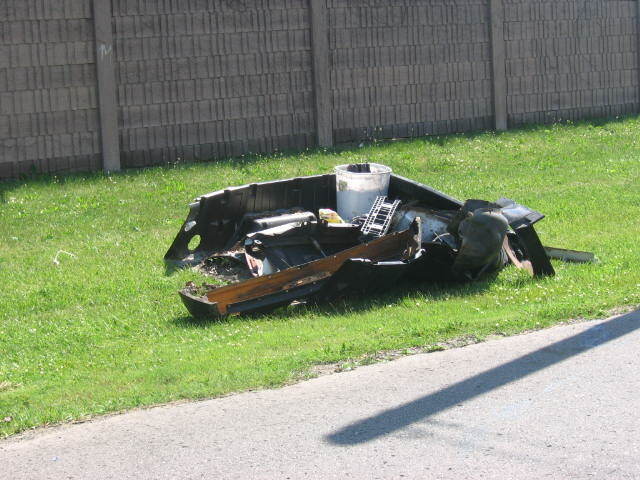 Warrendale (Detroit) Blog: 3 Months Into the "War on Illegal Dumping"
It's now been three months since Mayor Kwame Kilpatrick declared "War on Illegal Dumping". I wouldn't expect everything to be completely solved in three month's time, but that is enough time for some measurable progress to be made. With that in mind, I thought it be a good idea to step back and review the progress to date. Mayor Kilpatrick promised action in four distinct areas: tenant evictions, vacant lots, tire disposals and enforcement against violators. The Mayor proposed amending the City Code to require landlords to provide roll-off containers for the evicted tenants. 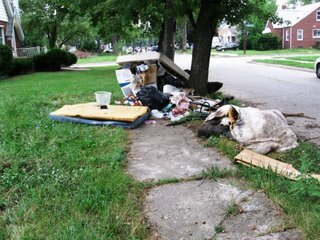 This, of course, was meant as a substitute for having their stuff stay on the curb for weeks or months at a time. I don't know the status of this proposed amendment to the City Code but, as I look at this eviction that happened a couple of weeks ago on Montrose, it's clear that roll-off containers aren't showing up when folks get evicted. 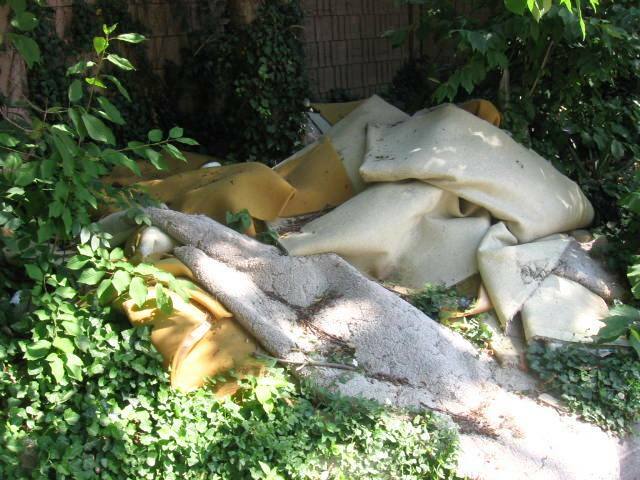 Vacant lots have always been a haven for illegal dumping - both in Detroit and elsewhere. Mayor Kilpatrick promised to expedite the sale of vacant lots. He also offered to sell vacant, city-owned lots to adjoining property owners for only $200. This, in my opinion, is a good idea and a good start. The challenge, however, is that there haven't been enough people looking to buy these parcels of land. The only solution to that problem, though, is to keep plugging away at it and reminding folks that this land is for sale and for sale cheaply. The Mayor proposed a major crackdown on scrap tires that were simply discarded in our neighborhoods instead of taken to a proper facility. I haven't actually seen the Detroit Police Department pulling anyone that's hauling tires over nor I have heard of the changes in the state law that Mayor Kilpatrick talked about in his original statement. However, I do know that there aren't anywhere near as many scrap tires lying around in Warrendale as there were three months ago. For that simple fact, I think we have to give the Kilpatrick Administration a certain amount of credit. Mayor Kilpatrick proposed better adjudication against violators through the Department of Administrative Hearings. The problem is: what happens for properties that are in a weird limbo between City-owned vacant properties and the type that the DAH normally prosecutes? To give an example: there's a brick wall between the Doubletree Hotel on Ford Road and the rest of Warrendale. The area along Kirkwood that's immediately behind that wall is a prime spot for illegal dumping. And since the land is owned by the City, who does the City go after for the costs to clean-up? Plus, since there's no street addresses, it's a challenge when you want to report the whole thing to the 3-1-1 Call Center. The whole problem continues as one follows that wall along to Faust. 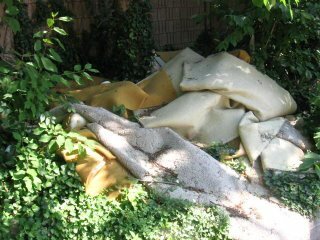 The area where Faust curves and meets up with Greenview is another prime area illegal dumping. Of course, the challenge is: how do you use a curve in an otherwise straight road as an address? Overall, I have to give Mayor Kilpatrick a C- for his prosecution of the "War on Illegal Dumping". This is a significant improvement over the way things were in April, but there's still a long way to go.